Derby County FC is one of the original teams included when the Football League was established in 1888. They have won the Division One twice and the FA Cup once. Derby is also infamous for bad result in Premier league; during the 2007-08 season they only managed to win one game. Among the most prominent players in the history of the club Steve Bloomer, John McGovern and Colin Todd could be mentioned. 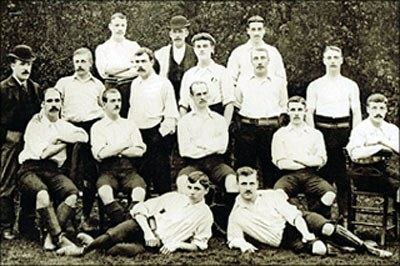 Old photo of the team from 1895. Noticeable is also that the club Derby Midland FC merged with the Derby County in 1891. Derby Midland and Derby County did both participate in the FA Cup season 1884-1885. At that time Derby Midland was clearly the stronger team, although they didn't meet in the competition. There were other "Derby"-named football clubs in the 19th century, such as Derby Town and Derby St Luke's.